"Every woman transitioning to a leadership role should take this course. It provided me with a network of inspiring women and the tools to continue to ask for what I want." Hear from Faculty Director Rita McGrath on the learning approach in the program. The research and evidence is clear: inclusive leaders and inclusive organizations outperform those that are not, yet women remain underrepresented in all levels of management. This program is designed to help elevate the impact of women leaders – enabling them to navigate the business landscape, develop and leverage their talents, and step into roles of greater influence. Despite the compelling case for equality of gender representation at all levels of an organization, even with the best of intentions, unconscious bias can distort critical decisions influencing who moves ahead within an organization. During Women in Leadership: Expanding Influence and Leading Change, participants will learn time-tested techniques and practical ideas which women can apply immediately to their career and that can help combat these performance-limiting biases. Get ready to be inspired, network with likeminded colleagues, and learn applicable skills for an immediate impact on your career and your organization. Professor Rita McGrath, a globally recognized expert on management and strategy, is the program's faculty director. Focused on women’s advancement, this innovative program will provide participants with the knowledge, skills, tools, and real-time problem-solving needed to further the advancement of women in leadership roles. The Women in Leadership: Expanding Influence and Leading Change program prepares participants to expand their influence and advance their leadership. Participants become more confident of their personal leadership identity, and committed to the changes they will effect in the workplace. Each iteration of the program features a set of guest speakers from the outside world who share their leadership journeys with the participants in the program. Recent guest speakers include Sharon Price John, president and CEO of Build-a-Bear Workshop, who explained how she effected a turnaround at her organization, and Nancy McKinstry, CEO of Walters Kluwer, who spoke about undergoing a digital transformation at her company. In this video, hear from guest speaker Rachel Mushahwar, General Manager, Head of Americas for Retail, Hospitality, and CPG at Intel, on why the topic of women in leadership is important to her. The Women in Leadership: Expanding Influence and Leading Change program uses a combination of online tools, interactive lectures, inspirational talks, and workshop exercises for individuals and groups. Sessions taught by Columbia Business School professors, women’s leadership practitioners and business leaders are supplemented by sessions with colleagues from various fields and industries. The weeks leading up to the program will help participants frame their personal goals for participation in the course, connect participants with each other, and solicit participant input to be used throughout the program with various online activities. Evaluating your formal and informal networks to identify the strengths of your network and individuals who can become supporters of your mission. Strategies and techniques for making your voice heard in challenging situations. Specific approaches for overcoming obstacles in conflict situations and managing negotiations to a beneficial outcome. Applying these new learnings to the opportunity to advance women’s leadership in your workplace and develop strategies to make that happen. The Women in Leadership: Expanding Influence and Leading Change program is designed for middle- to upper-level executives who are looking to develop their leadership abilities and expand their impact and influence. The Women in Leadership program brought together some of the most brilliant women and men from around the world, that were redefining what a leader is. In this way, we all learned how to define leaders as role models and not by gender. If we all strive to empower others through our words and ideas, we will be able to move forward by uplifting others as well. I can already see the changes in my life & career. "Every woman transitioning to a leadership role should take this course. It provided me with a network of inspiring women and the tools to reflect on my career and what I need to do to continue to ask what for I want. " "The Women in Leadership course gave me another perception of leadership and a way to be an authentic and different leader in my organization." "The Women in Leadership program provided me with tools and frameworks I can utilize to make an immediate impact on my organization." "The program was a great way to get women together to discuss leadership challenges and collectively make commitments to improve the advancements of women in the workplace." My time at the Women in Leadership program was very impactful and gave me tools and tips for moving forward in my career. Rita McGrath is a globally recognized expert on strategy, innovation, and growth. Her work and ideas help CEO's and senior executives succeed in rapidly changing and volatile environments, and she is valued for her rare ability to connect research to business problems. Recognized as one of the top 10 management thinkers by global management award Thinkers50 in 2017 and winning the award for outstanding achievement in the strategy category, McGrath speaks regularly at corporate events, such as the Microsoft CEO Summit and the World Economic Forum meeting in Davos. She appears regularly on television and radio and is often cited in the press, including The Wall Street Journal, The New York Times, Financial Times, and Businessweek and has published several articles in the Harvard Business Review. McGrath is the co-author of three books in addition to her latest book, The End of Competitive Advantage: How to Keep Your Strategy Moving as Fast As Your Business (Harvard Business Review Press). She has also been named one of the top ten business school professors to follow on Twitter, and was named one of the 25 smartest women to follow on Twitter by Fast Company magazine. In 2009, she was inducted as a fellow of the Strategic Management Society, an honor given to those who have had a significant impact on the field. Prior to life in academia, McGrath was an IT director, worked in the political arena and founded two startups. 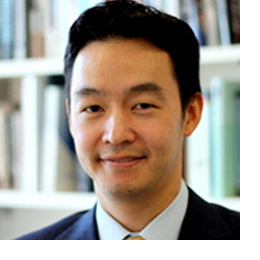 Jerry Kim is an Assistant Professor of Management at Columbia Business School. His research examines how social factors such as status hierarchies or network ties shape the strategies and performance of firms. He is particularly interested in the competitive dynamics of the healthcare industry (i.e., hospitals and bio-pharmaceutical firms), and the political aspect of business strategies in matters such as regulation, corporate social responsibility, and income inequality. He teaches the Strategy course in the MBA Core Curriculum at Columbia Business School, for which he has received the Dean’s Award for Teaching Excellence in the Core, and the Singhvi Prize for Scholarship in the Classroom. He also teaches an MBA elective on Technology Strategy, and sessions on Innovation in Columbia’s Executive Education Program. 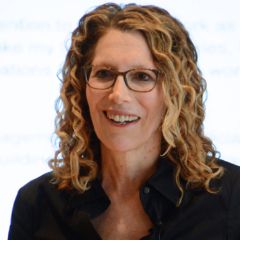 Experience: Deborah combines expertise in cognitive, behavioral and social psychology, public speaking, and coaching. She started her career at age 17, when she won the U.S. National Championship in public speaking as a high school senior and was immediately recruited to coach on presentation and communication skills at colleges and corporations. Deborah is an instructor of Management Communication at the Wharton School of The University of Pennsylvania. She also serves as a Visiting Professor of Executive Communications at the Beijing International MBA Program at Peking University, China, where she prepares senior leaders from around the world to communicate more effectively in a growing global marketplace. She has been a featured expert and a contributor to Harvard Business Review, The New York Times, Oprah Magazine, Forbes, Fast Company, Bloomberg BusinessWeek, Fox Business Network, and American Express OPEN Small Business Forum. Deborah is the author of “Tips of the Tongue: The Non-Native English Speaker’s Guide to Mastering Public Speaking,” which highlights her global coaching and teaching work in presentation skills. Training and certification: International Coach Federation, Professional Certified Coach(PCC); The Coaches Training Institute, graduate; Coach U, Core Essentials Program graduate;Coaching Out of the Box, Licensed Trainer; DiSC Behavioral Inventory, Certified Facilitator;Appreciative Inquiry, Certified Facilitator; Kaiser Leadership Solutions, Leadership VersatilityIndex (LVI), Certified Facilitator. Coaching experience: Deborah has coached leaders and delivered leadership workshops in advertising (FCB, Anthem Worldwide), management consulting (BCG), finance (Bloomberg, American Express), consumer goods (Kraft), pharmaceuticals (Pfizer, Novartis, Celgene), automotive (Toyota, Mercedes-Benz), technology (Microsoft, Google), non-profits (JCC Association of North America, American Bar Association), and government (U.S. Senate, U.S. Army). Recent clients include: • Integration and Operations Manager, software • President and Managing Partner, legal • Practice Leadership Team, consulting • VP, Sales, consumer products • Leadership Team, government (China) Deborah’s approach to coaching, consulting, and training combines the use of coping models (to reduce anxiety and increase confidence) and mastery models (to accelerate learning and skills transfer, as well as to lock in behavior change). Deborah brings her warmth and wit to every engagement, as she knows that humor reduces people’s resistance to change. Deborah believes that the most successful leaders are those who balance professional credibility with personal authenticity, combining their deep expertise with transparency about where they need to grow. 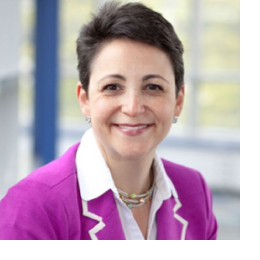 Jane teaches in the Women in Leadership program at Columbia Business School as well as in the Strategic Communications Masters Degree programs at Columbia’s School of Professional Studies. She is the founder and president of Ovid, Inc., a strategic communications firm that specializes in speech, presentation, and media training. Her clients include corporations such as Bloomberg, Nickelodeon, and Viacom, tech companies like Vox Media and Squarespace, and nonprofits such as Memorial Sloan-Kettering Cancer Center, Mellon Foundation, and Robin Hood Foundation. Individual clients include TED talkers, National Book Award winners, rising film stars, and college commencement speakers. A former writer, producer, and director of documentary films, Praeger has created awardwinning programs for PBS, WNET, and the U.S. Department of Justice. Before starting Ovid, Praeger conceived and executed national media campaigns for Pro-Media, a boutique public relations firm in New York City. For four years, she also wrote the nationally syndicated radio program, “Inside Business” for William S. Ruykeser, managing editor of Fortune magazine. A lifelong New Yorker, Praeger lives and works in the Flatiron district of Manhattan, just a stone’s throw from one of her favorite haunts, the Union Square Farmer’s Market. Christine Sarkis is a Corporate Communications professional, specializing in commercial Aviation communications. Her tenure in global airlines for nearly a decade includes advisory roles in brand launches, executive communications, integrated campaign design, outreach, media relations, strategy development, and issues management. 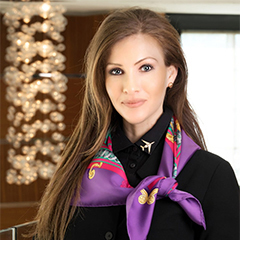 She has held a number of marketing communications positions in Canada in petroleum, government and telecommunications sectors prior to relocating to the Middle East region – and is now based in the Kingdom of Saudi Arabia. A passionate communicator and advocate for innovation in the field of public relations, her views and outlook on successful communications management in corporations has been featured in internal and external publications. She has also been nominated as a speaker at global industry conferences. Christine holds double Bachelor of Arts degrees in Political Science and Communications, and a diploma in Marketing Management, all from the University of Calgary in Alberta, Canada. She is a Board member on the Middle East Public Relations Association.